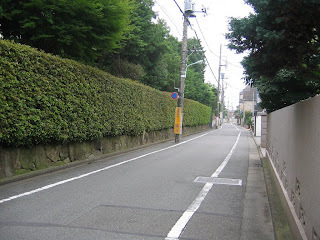 As I entered Haruna's parents' bedroom, there was nothing out of the ordinary other than the bed sheet being larger than the mattress. I took a look under the sheet. There were indeed large amounts of money in the boxes mentioned. So much that I could buy a lot of the most expensive things I could think of or have a comfortable life of retirement (though I'm not even an adult yet), but it can't buy me happiness. I wonder where this money came from? There is a sense of guilt when grabbing some of it, but seeing that it came from the parents of whose body I'm now in, it should be alright. Monday, May 23 (The following day) came. I ate some of the snacks I bought yesterday. However, taking a bath and changing clothes is a whole new experience for me: I now have a beautiful body to maintain and I feel funny putting up and removing my underwear and also clothing that was not originally mine. Even though I'm wearing a skirt, it feels like there's nothing below my waist with all the air I'm feeling from my bottom. To tell you the truth, I actually look and feel good wearing like this. I grabbed my bag, put up shoes, got onto a bike lying around near the front door (I checked the pressure yesterday) and head to the train station. To tell you the truth, I don't even know where the station was or even where the school is! However, my instincts seem to be guiding me in the right direction. I reached the station and parked the bike around there. The fare gates looked different from what I was familiar with. On a closer look, there were people taping a card, their wallet, mobile phone and even their bag on a marked area of the fare gates. For the people who tapped their cards, some bought the ticket at a machine at a corner while others just took it out from their pocket. I dug through my skirt pocket, not knowing what's inside, and found a card that looked similar to theirs and it worked! I want to jump for joy, but I can't: there is some invisible force that prevents me from doing so. I can see why. The train platforms seemed to be quite crowded, but I have seen worse. 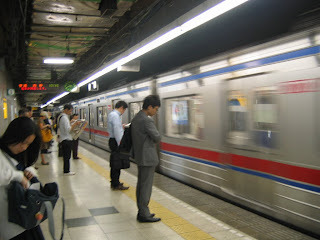 Upon boarding the train, I heard an unfamiliar voice (to me) calling me. Looking at how she greeted me, I assume she's my close friend. She's also wearing the same uniform as I was wearing. Recalling the photo in the contact list, the name 高橋ゆかり came to my mind. She has a twin sister by the name Haruka, but apart from living overseas, her whereabouts are unknown since their parents were divorced when they were young. Me: "Oh, Yukari-chan! I'm feeling better now. I was born with a weak body, that's all. So what's been happening since, erm, you know what happened." Yukari: "Wow! You actually remembered me! (^o^)丿(笑) ｗｗｗｗｗｗｗ　Anyways, I have been so kind as to take down notes for you. I heard from 笹川さん (Nagisa) that when you woke up you looked at yourself as if you were suddenly turned into an adult. 冗談冗談だよ！(^_^)/ I also don't blame you for what happened to a close family friend of yours. Anyways, did you catch ギアス yesterday? I was so shocked! (・。・) Why must it happen at such an inconvenient time? I think....."
Yukari talked about stuff I know nothing about all the way until school. There were more people wearing the same uniform (not sure about the males though) the closer we got to the school. We reached the school, I can honestly say that it looks bigger and better than mine, even though it's considered average there. Yukari: "Oh yeah! (>_<) I forgot that you were not around since the school year started last month. あたし忘れた。。。 You go check with 先生 or the principal to see what class はるなちゃん is posted to. じゃ、また。I don't want to be late for class." Me: "Hey! Wait! Can you at least....?" 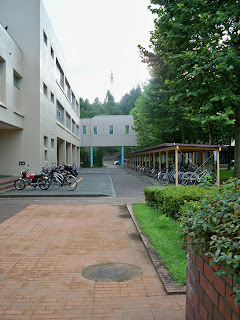 Yukari ran towards the stairs nearest to the entrance in a hurry without telling me where the school head or the staff room is. Hmmm..... Maybe I should start looking around to see if I can find it. It would be quite awkward if I were to ask someone Haruna (whose body I'm in) may know. The problem is that I don't know practically anyone here. It meant (what was heard from Nagisa Sasagawa) that the protagonist was acting more mature-like than usual.